Characteristic of swamps, such as river floodplains, even cedar swamps, often with Silver Maple, and also in rich upland hardwoods; also an important early successional species. 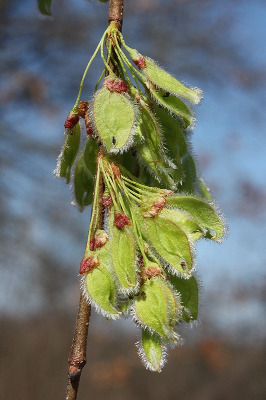 Occasional plants, especially on young sprouts, produce leaves as harshly scabrous above as in U. rubra, feeling like coarse sandpaper, but the leaves are more likely to be smooth beneath. Both this species and U. rubra have a familiar and characteristic “vase-shape,” whereas in U. thomasii the trunk generally extends straight into the crown before forking. Our stately elms have suffered especially from the Dutch elm disease, first noted in Michigan in 1950 near Detroit, Wayne Co., and subsequently fatal to most trees essentially throughout the state; the disease is caused by an ascomycetous fungus, Ceratocystis ulmi, spores of which are carried by beetles and enter healthy tissue via wounds caused by feeding of the beetles on young shoots. The outer bark of this species consists of alternating pale and dark brown layers, while in U. rubra the outer bark is solid brown. MICHIGAN FLORA ONLINE. A. A. Reznicek, E. G. Voss, & B. S. Walters. February 2011. University of Michigan. Web. 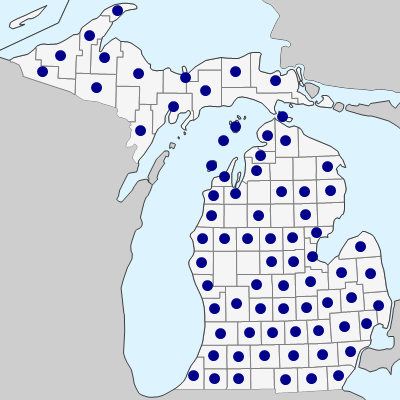 April 21, 2019. https://michiganflora.net/species.aspx?id=2748.